New York Toy Fair is by no means your typical convention. 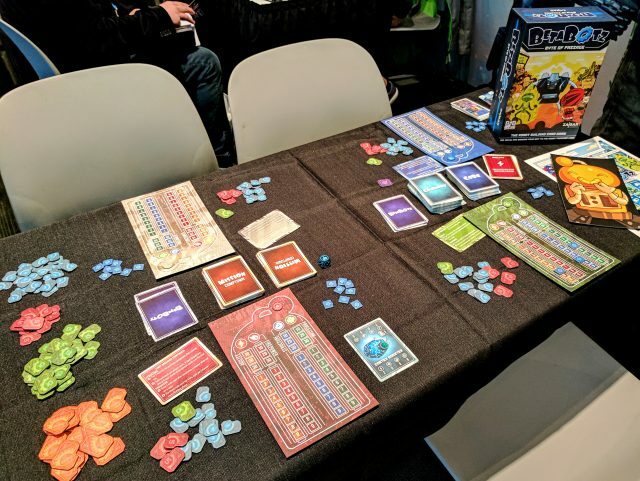 As an industry trade show, Toy Fair presents an opportunity for board game publishers to court business owners and get products onto their shelves. This audience runs the gamut from local shops to mass-market chains, where a distribution deal can have a startling impact on a game publisher’s bottom line. Oh, and sometimes they let in people who write for blogs. Some publishers arrive at NY Toy Fair with large booths and displays of unreleased product, hoping to catch the eye of any interested buyer, while other publishers rely more on their distributors and sales agents to negotiate their retail relationships and push existing titles. There’s also much that can be read into a publisher’s booth location: have they chosen to exhibit among neighboring booths that cater to specialty toy stores, comic book stores, hobby stores, or traditional local game shops? As a result, the board game industry is scattered throughout one of North America’s largest convention centers. With one whirlwind day to cover the show, I eschewed any notion of in-depth coverage, instead hoping to complete one full pass and bring back a roundup of what personally caught my eye. 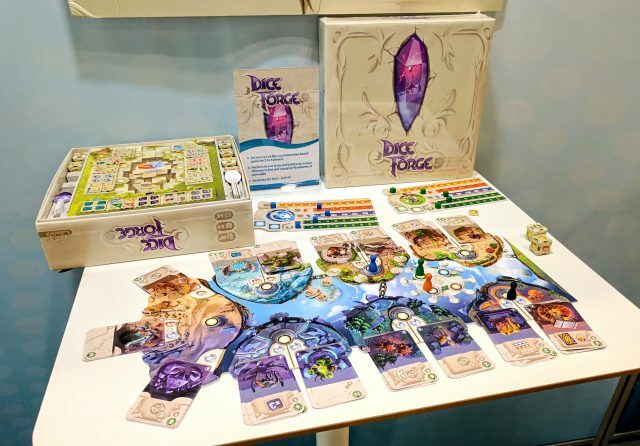 The largest force in board gaming was showing off plenty of upcoming releases, while also heavily promoting Fantasy Flight’s Star Wars license. On a personal note, this resulted in me finally getting a demo of the Star Wars Destiny collectible dice game, after which I promptly shredded my credit cards in self defense. Luckily, restocks have still not landed, but Asmodee confirmed that mass-market retail has lined up with demand, establishing hopes that this game system may go mainstream in the Spring. Dice Forge was the real draw for me. While customizable dice have been done before, nobody has cracked the code of making a breakout hit with that component. Pairing Régis Bonnessée, the design mind behind Seasons, with the typical high-production values of Libellud, gives some confidence that Dice Forge will be up to the task. Gameplay here presented itself as a straight-up engine builder with a game flow very similar to that of Dominion. 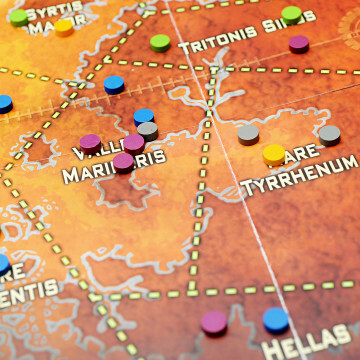 Most of the hobby’s interested was in Pandemic Legacy Season 2, and that’s warranted for what will be the sequel to the top-rated game on BoardGameGeek. For the first time, the back of the game’s box was revealed, showing a few key details on how this second entry in the Pandemic Legacy trilogy will play. The map shown here is curiously obscured, but while the Asmodee rep was very tight-lipped, my suggestion that this map was printed as a giant-sized scratch-off ticket was ridiculous enough that a firm denial was possible. What you see on the box is exactly what will be inside. Catan is being taken in a new direction with a campaign-based Seafarers extension. This adds four scenarios that can be played in a sequential (non-legacy) campaign, and while most publishers would be hesitant to release an expansion for an expansion, Seafarers has sold more copies than most other base board games. This is likely a smart move for Asmodee, as it’s not a stretch to imagine a segment of consumers who have adopted Catan as “the new Monopoly” and simply want more of that brand, not any deeper participation in the hobby. As a publisher for whom King of Tokyo keeps the lights on, Iello is wisely rolling out a series of $10 monster packs, each complete with a standee figure, health dial, and full set of power cards compatible with any edition of the game. Cthulhu is the first new character out of the gate, but Iello is planning for 2-3 per year, but has made no commitment to how many will be sold at retail vs offered as promotional items. The rest of Iello’s presence was focused on marketing its back catalogue, with exception of Pyramids, a light strategy game from Brett J. Gilbert and Matthew Dunstan, the design duo behind 2015’s hit Elysium. A variety of building materials are used in various structures, but the strategy of Pyramids stems from different end-game scoring rules for each material type. 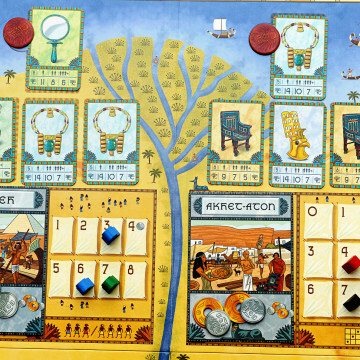 Given the theme and weight of Pyramids, the Iello rep was not shy about stating that this was the response to Imhotep’s success last year, but Iello does seem to have created a wholly unique game in this mold. 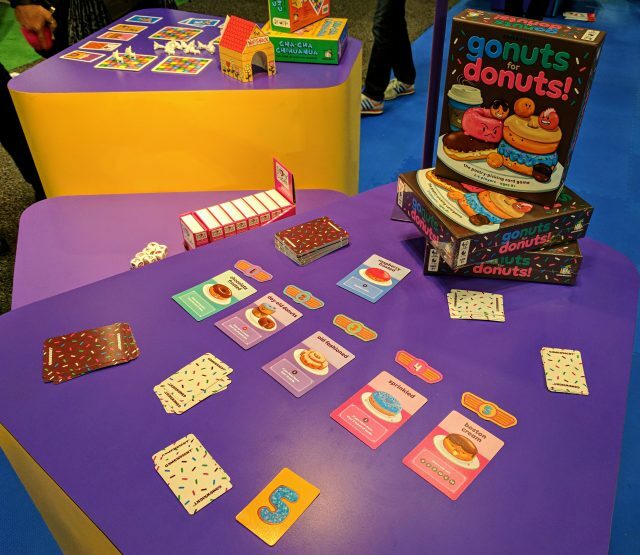 The standout game from one of the industry’s top children’s game publishers was Go Nuts for Donuts, a success fall 2016 Kickstarter from Daily Magic Games which Gamewright will be rolling into their portfolio. Go Nuts for Donuts is clearly in the vein as Sushi Go!, but with simultaneous selection from a market, rather than card drafting. If Gamewright wants to corner the market on cute food-themed card games, that’s fine by me, and the Kickstarter well has been kind to them in the past, with the successful Bring Your Own Book following a very similar path. After falling in love with last year’s Dr. Eureka dexterity game, hype set in early as I was greeted by Dr. Microbe and Dr. Beaker within moments of entering the convention center. Yet while these games are interesting iterations on the Dr. Eureka formula that will surely be loved by kids, the games don’t seem to have Dr. Eureka’s potential to blow the lid off of the age recommendation. 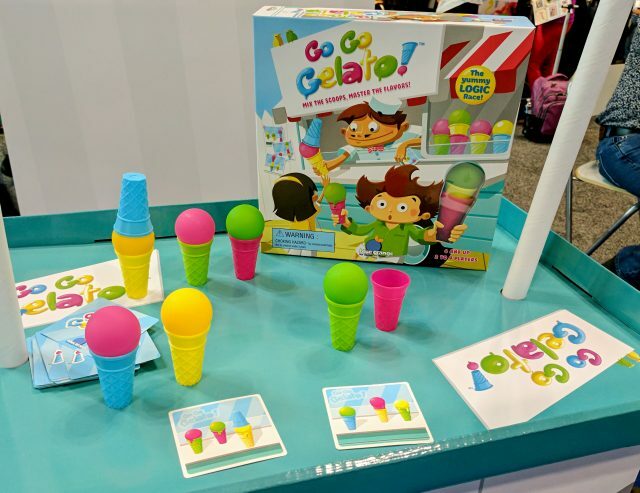 Instead, where Blue Orange hit a home run is with Go Go Gelato, a remake of Dr. Eureka that reduces the amount of fine motor control needed, ensuring that even the youngest players will be able to compete, yet retaining much of what adults love about this formula. I’ll be honest, I’d never heard of B&B Games Studio before entering Toy Fair, but this first-year exhibitor had an impressive lineup of products for such a young company. Most notably among them was Destiny Aurora, which had recently been through a successful crowdfunding campaign. In a crowded market of miniatures-focused thematic games, I was glad I gave Destiny Aurora a closer look as it comes with a genuinely interesting twist: players engage in two simultaneous games where one board represents a space battle and the other a ground skirmish. There’s interplay between the two, as ships can descend to the planet and ground forces can come onboard to fill various crew slots, enabling ship abilities. Beta Botz is a character-building game that resembles Munchkin play but with a few key tweaks that appear to be genuine improvements. Character upgrades are purchased via auctions and when a monster enters the field, every player must individually face them (but with the same opportunities to come together as teams to overcome difficult challenges). Money comes into play via the auctions, partnership negotiations, and its role as victory points after a set game length, so Beta Botz presents itself as a streamlined Munchkin-style game with less downtime and more strategy. As a company with comic book publisher roots, Cryptozoic has certainly proven itself capable of wielding attractive licenses. While the original Ghostbusters board game raked in over $1.5M only to land with a thud once gamers sank their teeth into the gameplay, a sequel quickly followed and still brought over $750k in crowdfunding. 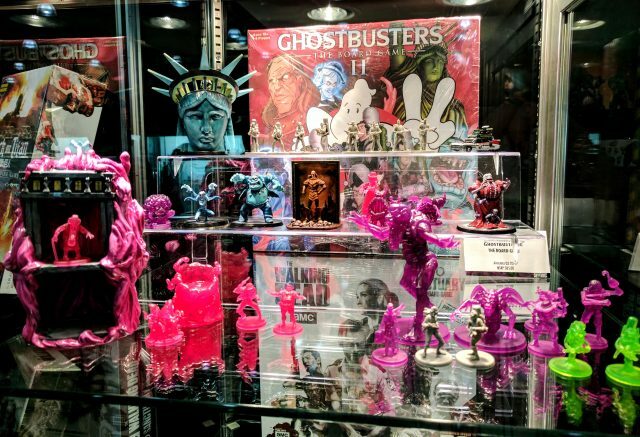 Setting foot in Cryptozoic’s Toy Fair booth, it became apparent more than ever that miniatures can certainly move dollars, as the Ghostbusters II sculpts even had me itching for my wallet (that Statue of Liberty!). Seeing this as a clear strategy, Cryptozoic has also partnered up with the miniatures experts at New Zealand-based Weta Workshop to bring GKR: Heavy Hitters to store shelves. If Ghostbusters wasn’t going to get you, giant robots just might. Cryptozoic had much more on offer, such as their expanded slate of Cartoon Network and DC Comics-licensed games. The publisher continues to use simple deckbuilding games as an easy way to attach licensed and bring comic shop gamers into the hobby, but is also branching out with a series of unique Rick & Morty games as well as a DC Comics version of Spyfall. Not every game from Cryptozoic is licensed or crowdfunded, though. One of the publisher’s early successes, Epic Spell Wars, is getting a third product in its line. I’m also intrigued by Internal Affairs, a social deduction game combined with elements of codebreaking that is finally being brought to North America after a 2015 Hong Kong release by local publisher Capstone Games. 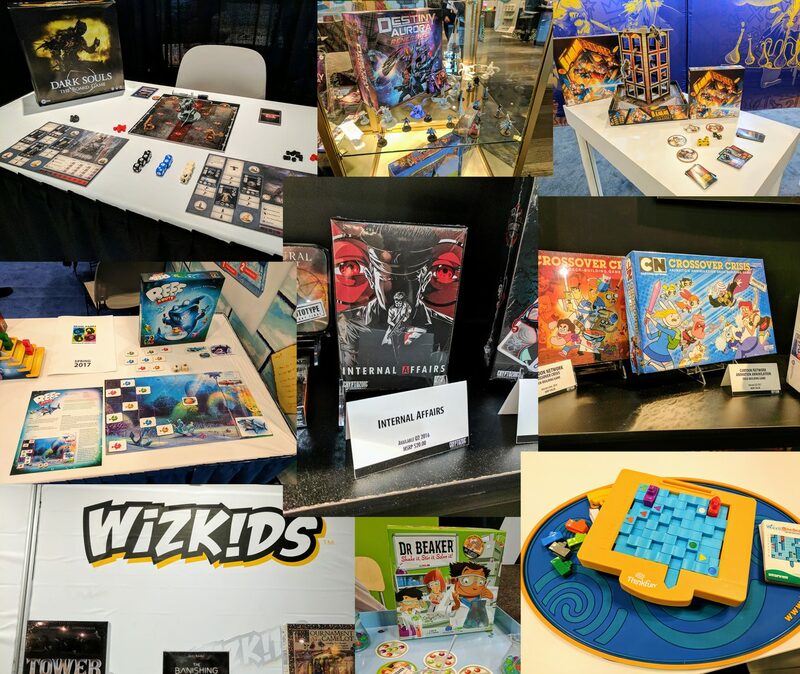 From a pure booth design perspective, Brain Games brought my favorite setup to Toy Fair, as it was completely skinned with art from my Daily Worker Placement “Game of the Year” selection, Ice Cool. Setting foot in the Brain Games booth meant entering a life-sized version of an Ice Cool room, and I was happy to do so. 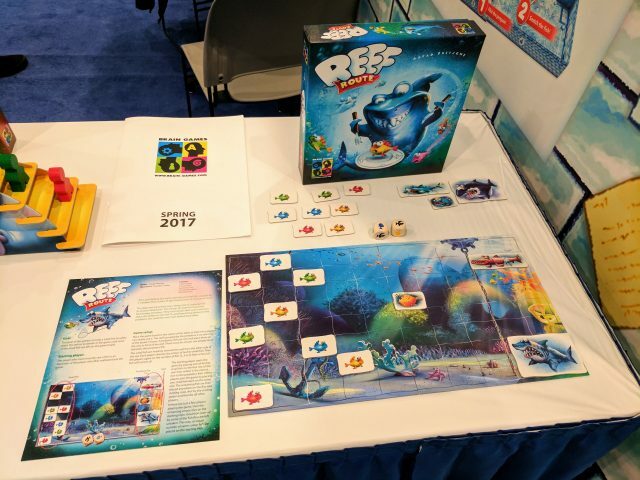 Brain Games brought three games to Toy Fair, all focused on establishing their status as a publisher of children’s-focused games. The best of these seemed to be Reef Route, a roll-and-move chess match perfect for very young gamers. In Reef Route, players must navigate their color fish across the board, while also steering predator fish into the paths of other players. 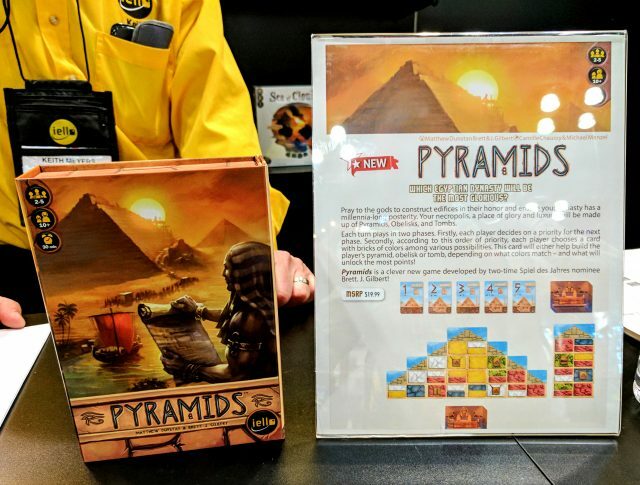 I was impressed by Pyramids at Toy Fair. 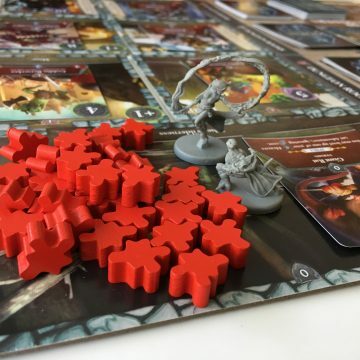 Did you do a demo of Asmodee’s new escape room game? Oh wow, Asmodee have an escape room game on the way, too? The hotness!! I’m not sure if Matt checked it out, I think this was all he caught in the day he attended. -Nicole.